Food speciality Special tastes for special guests. In 1896 Lokodi Gergely, a local inhabitant founded a sawmill on the wider branch of the Niraj. He served in World War I near Doberdo, Northern Italy, where he saw a trout breeding pond. And he had a dream… As soon as back in his native village, he started a completely new business in Szeklerland: trout-breeding. By the year 1934 he worked out a system of trout-breeding ponds. The trout bred here were soon sold even in Bucharest and Budapest, where they were transported by rail in wooden cases, on ice blocks. After World War II trout-breeding was restarted but not long after, the process of nationalization in the Communist era limited the activity again. In the newly nationalized trout farm the Romanian authorities had to employ the former owner, Lokodi Gergely, as nobody else knew this occupation in the region. After the fall of Communism,in 1994 the old business was once again launched, and soon flourished. 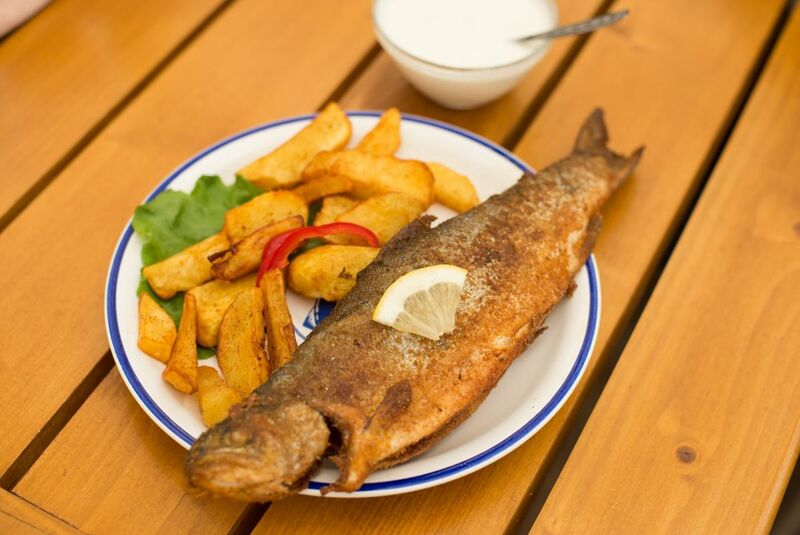 Thenew Halászcsárda restaurant opened in 2009, where visitors can taste the truly delicious cornmeal-crusted fried trout, served with mujdei (garlic sauce). Special tastes for special guests.